The Gentleman Crafter: Quote Wallet Tutorial Is Up! What a wonderful weekend this has been! I have so enjoyed all of you're AMAZING comments on the Bird Song Project that is to be determined on Thursday! LOL!! Yahooo! Too cool! Thank you for playing along! You guys are totally amazing, creative and very imaginative!! Thank You! Tonight, I finally finished the tutorial on the Quote Wallet! Yahoo! To know me, is to know that tutorials are few and far between because of the time it takes to write them. I am however getting better! LOL! If you are interested please check out my Etsy store by following the link below. Once again, thank you all for playing along with me on a Bird Song Project. I can't wait until Thursday! 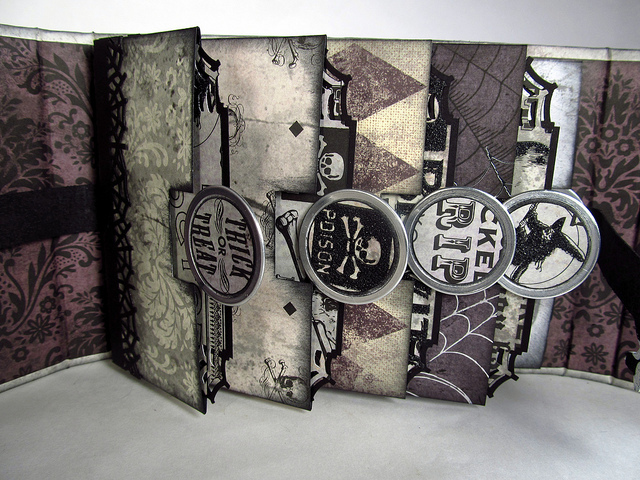 Tuesday, I will be featured on Graphic 45's blog with my FAVORITE Halloween project yet! On Wednesday, I will be sharing with you how to make a really fast and easy Halloween project using Graphic 45's Happy Haunting Collection over at the Paper Crafter's Library! It's going to be fun! Friday, I have a project I'm SOOOOO excited to show you....Yep, I've been doing 3D Dylusioning again!!!! A hint...What does Dylusions and 123 & ABC have in common??? LOL! So a cool week! Please come join me! So that's it y'all! I hope you had a wonderful weekend and also wish you a great week ahead! I love these Jim! The Halloween one is awesome! 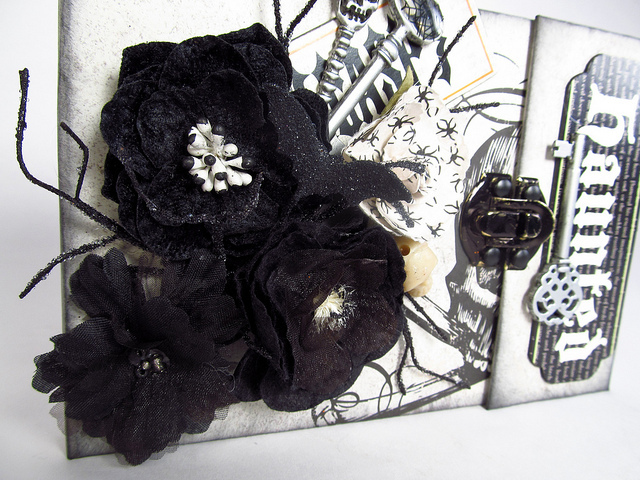 Love the black flowers and your skeleton closure. I might have to invest in a pattern :) thanks! What are the rings on the halloween one? Love the Halloween version of this project! Looking forward to all of your projects coming up this week too...I'll be back! Wow, sounds like you have been working overtime! 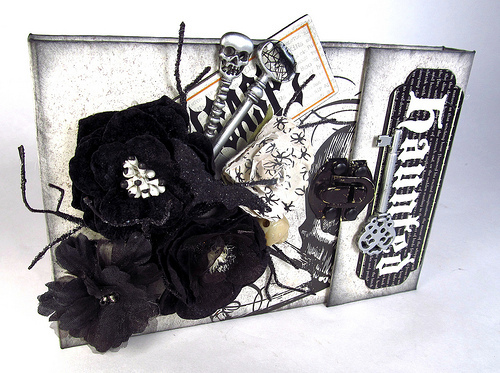 Love, love, love the embellies on the Halloween wallet...;o) Can't wait to see your latest creations. Woohoo! Love it! Etsy here I come! Sheesh what are you doing to me. Honestly I each time you do a project I think what will come next and wham you blow the lid off the place. These are just amazing i am in awe. I cannot even decide which one i like the most. That I will decide once i purchase it tomorrow and then I can pet the tutorial for a bit once i print it to decide:) Thanks for sharing your work with us. Oh my, loving the Halloween version! Can't decide which one I like better. Thanks for the preview of what's coming up this week. Looking forward to your latest creations. The Halloween wallet is over the top! The Halloween version is totally awesome!! Of course the original G45 was spectacular too! Your friend will love it for sure! I fell in love with this wallet the first time I saw it. The Halloween one is just as impressive. So glad you did a tutorial...so much faster than figuring it out for myself! Jim, I am pouting, cause I missed out on your halloween quote wallet tutorial. If you decide to put more up on your etsy site, let me know. Awesome, both of them! Looking forward to your 3D Dylusional..hmmmm..Have me thinking about what it could be. They are both awesome, the Halloween one is fantastic! Jim, your day must be longer than mine. I don't know how you get so much done, Amazing! The Halloween wallet is so cool, good job. I can't wait to see your G-45 project tomorrow. The Halloween wallet is the best. Love how you put everything together. Can't wait until pay day. thanks as always for sharing. Forgot this. I made my version of "Carol's Caddy" and it turned out great. I used book covers from recycled books so it was heavier. And I didn't make it to hold remote controls. 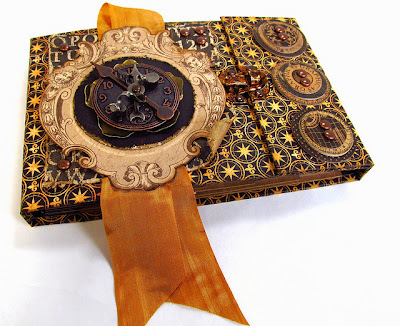 I use it on my working table to hold stamping blocks, tapes, glues, my big 6.5" x 12" ruler and rotary cutter. It is basically my worktop toolbox. And it works great. So I have no doubt I will love the wallet pattern just as much. Although not a fan of Halloween, and very much a fan of G45, I find that I like the Halloween version even more than the original one. Go figure! I think the latest wallet is superb! Congrats. I've got to make the Halloween version! There are some great Halloween quotes to use. I've already got Poe's The Raven going through my head.I'm so glad you made a tutorial. This is a perfect gift for all kinds of occasions. I have trouble 'proving I'm not a robot' toobut I figure it's good exercise for my brain. Lol. You have an great week yourself, Jim. The Halloween version is very cool (and I'm not a huge fan of Halloween themed projects). Thanks for the tutorial, Jim. I LOOOOOVE this Halloween version ! Wonderful, magnifique, j'adore ! 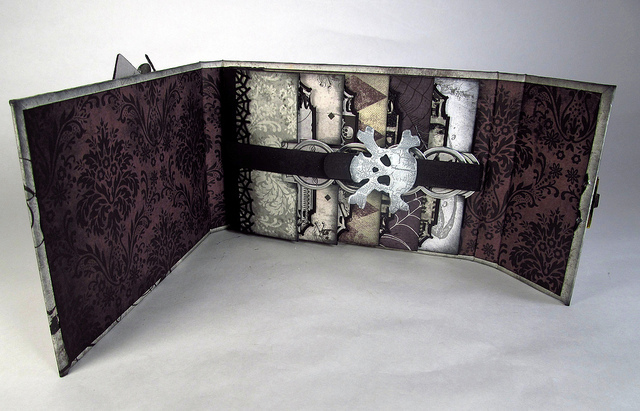 love the halloween wallet...gonna put in my purse for when i come visit your haunted house!!!!!!!! You really should teach this, I've not seen anything like it! I'd go!!! It's totally fabulous, and love the Halloween theme as well!!! This project is great! 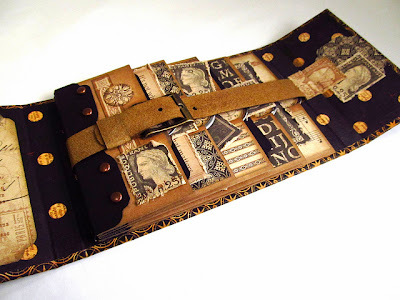 I love the wallet idea and it looks like something I can make. A tutorial video would be fabulous. Wonderful wallet...Where did you get those fun keys on the Halloween version? I Love the Wallet . Going to be an exciting week. I cant wait for the Happy Hauntings. Rest up. Sounds like a great week. Great quote wallets! You have been a busy bee! Looking forward to seeing your next Dylusional project. Wow!! 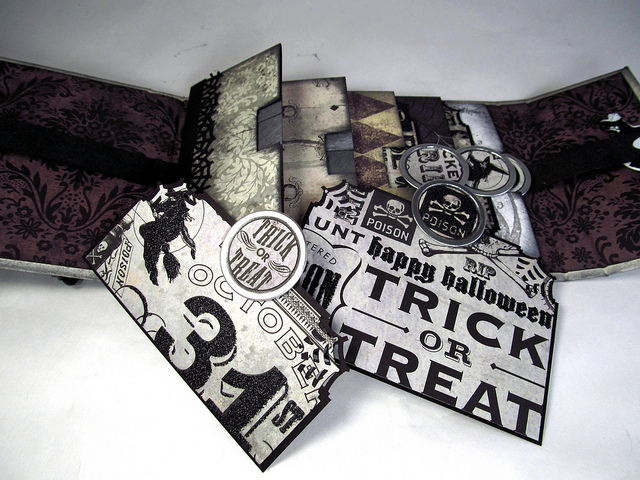 Totally love the Halloween Quote Wallet!! All of your projects are fantastic and I am always excited to see what you are creating next! Just got the patter from Jim. Very concise instructions. He did a wonderful job. Love the mini. Thank you, Jim. We think you are wonderful!